In exploration, sometimes you find more than what you’re looking for, including things that shouldn’t be there. As the Apollo 17 astronauts orbited over the night side of the moon, with the sun just beneath the horizon right before orbital “sunrise,” Eugene Cernan prepared to make observations of sunlight scattered by the sun’s thin outer atmosphere and interplanetary dust from comets and collisions between asteroids. The idea was to have the moon block the brilliant direct sunlight so this faint glow, called Coronal and Zodiacal Light (CZL), could be seen. They should have seen a dim “hump” of light in the middle of the horizon that gradually grew in size and intensity until it was overwhelmed by sunrise. What came next was not supposed to happen. Cernan did see the CZL glow, but it had a strange companion. A slim crescent of light appeared all along the horizon, and just before sunrise, faint rays appeared, similar to the columns of light seen on Earth when sunlight pokes through a hole in a layer of clouds. On Earth, the horizon glow seen at sunrise and sunset, and the rays, are created when sunlight scatters off atmospheric moisture and dust. But the moon has almost no atmosphere — its atmosphere is so thin, atoms and molecules there rarely collide with each other and it’s technically referred to as an “exosphere”. This thin atmosphere should not have produced the horizon glow seen. The sighting during Apollo 17 was not just a one-time freak event. “Similar sightings were reported on Apollo 8, 10, and 15 during planned observations of coronal and zodiacal light,” says Dr. Timothy Stubbs of NASA’s Goddard Space Flight Center, Greenbelt, Md., and the University of Maryland, Baltimore County. “Lunar horizon glow (LHG) was first observed between 1966 and 1968 by TV cameras aboard the Surveyor landers — robotic precursors to the manned Apollo landings — specifically Surveyor 5, 6 and 7, and possibly Surveyor 1,” adds Stubbs. While the Apollo observations detected LHG at high altitudes – extending up to around 100 kilometers (about 62 miles) above the lunar surface, the LHG recorded by the Surveyors was much lower – within about a meter (one yard) of the surface, according to Stubbs. Deepening the mystery is that LHG was not always seen. “The astronauts on Apollo 11, 12, and 14 did not look for CZL; however, similar CZL observations were made during Apollo 16 by Ken Mattingly, but no LHG or ’streamers’ were seen (to his great personal disappointment). 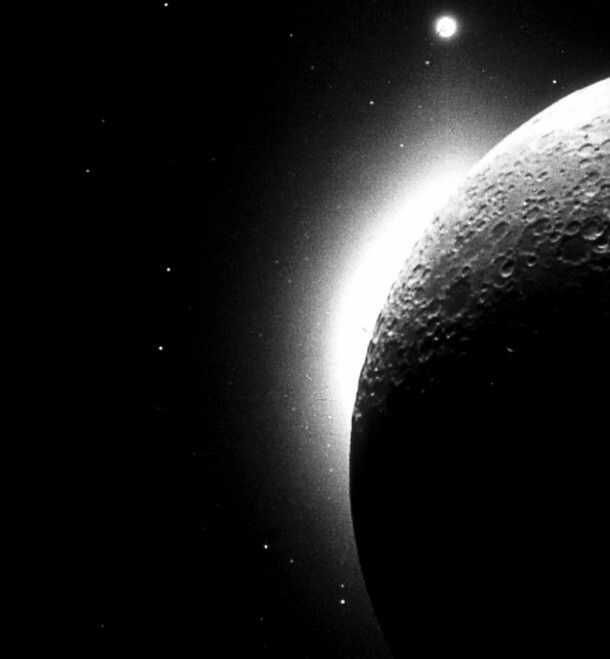 Analyses of coronal photographs from Apollo 15 and 17 revealed an ‘excess brightness’ along the lunar horizon, which was interpreted as LHG produced by sunlight scattering off a high altitude ‘dust atmosphere’. Similar photographs taken during Apollo 16 did not contain any excess brightness (consistent with the astronaut observations). This indicates that LHG is a variable phenomenon – sometimes you see it, sometimes you don’t,” says Stubbs. While dust can produce a LHG by scattering sunlight, the presence of even an intermittent high-altitude dust atmosphere was unexpected — the moon’s exosphere is far too thin for wind to blow and suspend dust. Although the moon is constantly bombarded by meteorites (mostly microscopic) that kick up dust, “the dust concentrations inferred from LHG are much higher than expected from debris ejected by meteorite impacts alone,” adds Stubbs. It has long been suggested that lunar dust gets transported electrically. For example, on the day side of the moon, solar ultraviolet radiation is strong enough to kick electrons from dust particles in the lunar soil. Removal of electrons, which have a negative electric charge, leaves the dust with a positive electric charge. Since like charges repel, the positively charged dust particles get pushed away from each other, and the only direction not blocked by more dust is up. The smaller particles likely get ejected higher because they are lighter. This might explain the different LHG observed by Surveyor and Apollo. The low-altitude glow seen by Surveyor appeared to be from larger, relatively heavy particles, while the high-altitude glow seen by Apollo astronauts was likely from the smallest particles. Small particles can get such a boost from the surface charge that they are lofted high above the surface and follow ballistic trajectories, returning to the surface under the influence of the moon’s gravity. This movement of the smallest particles could make fountains of moon dust. “We’re still at the stage of determining whether or not LHG is really there – this is one of the major objectives of the LADEE mission,” adds Stubbs. As early as 2012, NASA could launch the Lunar Atmosphere and Dust Environment Explorer (LADEE) spacecraft that will orbit the moon and look for the LHG and exospheric dust hinted at in the Apollo observations. LADEE will look for LHG using the Ultraviolet Spectrometer (UVS) instrument, which will measure the intensity of light at different wavelengths at a point above the lunar horizon. Each potential source – sodium or dust, for example — will produce a unique “signature” glow in ultraviolet and/or visible light. LADEE may also be able to use its star-tracker navigation cameras to observe LHG, which would provide details on the shape of the visible light scattering sources, according to Stubbs. LADEE also has a dust detector instrument to record any hits from high-altitude dust. “This modeling is important as it reassures us that, based on previous observations, the LADEE/UVS ought to be able to observe LHG and distinguish it from other scattering sources; i.e., it can satisfy one of its prime mission objectives. This model will be a valuable tool for analyzing and interpreting the complicated UVS scattering data in the future,” said Dr. Anthony Colaprete, NASA’s Ames Research Center, Moffett Field, Calif., Principal Investigator for the LADEE/UVS instrument. 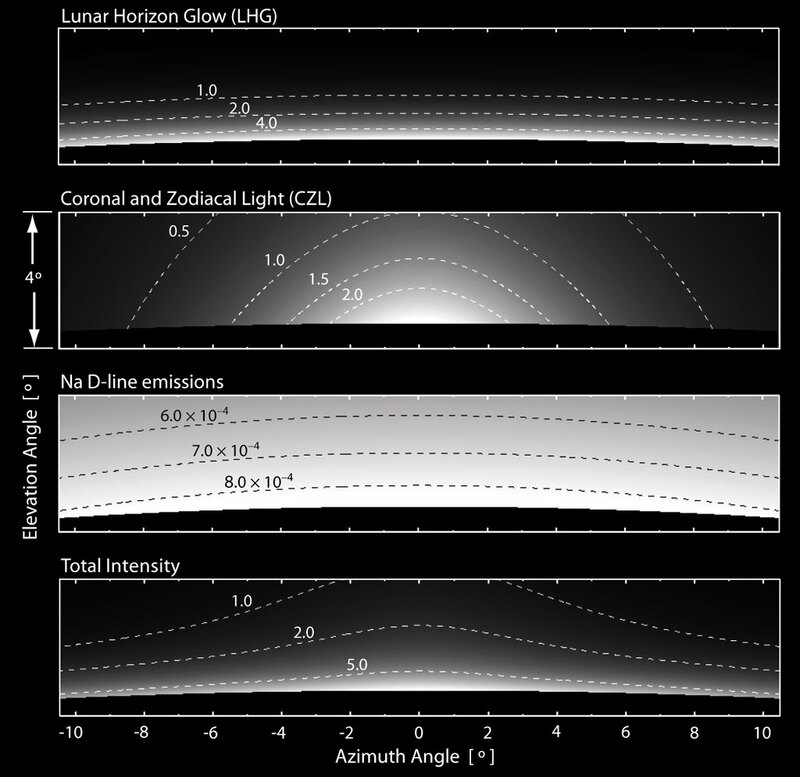 “Future developments of the model will include the capability to characterize the shape, size, and structure of the scattering dust grains, which will let us probe even further into the nature of the processes at work at the lunar surface,” adds Dr. Denis Richard of NASA Ames and the San José State University Research Foundation. Learning more about the strange lunar atmosphere with its potential fountains of sticky and abrasive moon dust is essential for future human exploration. “LHG could be telling us that the moon’s atmosphere is much dustier than is typically thought. It was well-reported that the Apollo astronauts found lunar dust to be a significant nuisance when exploring the moon, and it’s likely that these problems were exacerbated by electrostatic (static cling) effects. So a better understanding of the behavior of dust in the lunar environment would facilitate the development of more effective mitigation techniques,” says Stubbs. “The scattering of sunlight by dust in the lunar atmosphere could mean that the moon is not as good a location for sensitive astronomical observations as has previously been assumed. This characteristic of the lunar environment needs to be well characterized before an informed judgment regarding the benefit of lunar-based telescopes can be made,” adds Stubbs. The team includes researchers from NASA Goddard, NASA Ames, the University of Maryland, Baltimore County, New Mexico State University, Las Cruces, N.M., San Jose State University, San Jose, Calif., and NASA’s Lunar Science Institute, which is managed by NASA Ames. Stubbs’ research was published in Planetary and Space Science in April, and was funded by the NASA Lunar Reconnaissance Orbiter Participating Scientists program and the NASA Lunar Advanced Science and Exploration Research program. The LADEE mission and UVS instrument are funded by the NASA Science Mission Directorate.